If you have been surrounded with effects stompboxes for long enough, you will probably know perfectly well what typical wah pedal looks like. It has a treadle which is the main control you have. The result largely depends on your movement. But there are also dynamic and auto wahs. The concept behind these two is slightly different: they utilize classic stompbox chassis that merely activates the unit. The effect produced here has nothing to do with your foot action. It is generated through signal processing and leaves a lot of room for versatility. The model we are going to talk about today is from that vary family. Boss AW-3 is an improvement compared to its predecessors and offers some newer, funkier features. 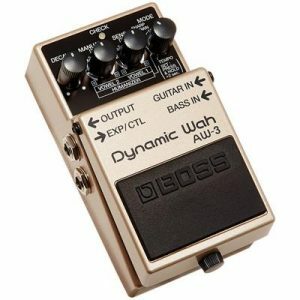 It is rather affordable for a wah pedals and is definitely one of the best in its price range. If you are always looking for innovative products and are not willing to risk emptying your budget, then this is just the right unit for you. But before you make the final decision, let me give you detailed information about AW-3 and all of its capabilities. Here we go! When talking about the dynamic wah pedals, it is only natural to underline their diversity. They open up the possibilities that are not accessible via typical units of such ilk. Just like its siblings, AW-3 operates with the help of the envelope filter. This way it is not limited to your movement. But rather, it can produce diverse types of the effect and respond to the dynamics of your playing techniques. This pedal is built to last and will stay with you for the years to come. It will still be in good shape if you drop it or run it over with a car. AW-3 has different inputs for your guitar and bass, which means it can be utilized with both of them. It does also have an input for the expression pedal so that you can get that extra help if needed. This bad boy is steeped with sonic features. It comes with five modes: Up, Down, Sharp, Humanizer and Tempo. It can operate in Manual mode as well. Humanizer has additional controls so that you can nail human-like vowels with ease. Just like the majority of Boss pedals, AW-3 operates with a battery and a power supply. It has a Check LED that indicates, whether the unit is activated or not and also displays the condition of the battery. Speaking of which, it is located in the small pocket on the lower part of the pedal and can be exposed by loosening the thumbscrew. On the whole, AW-3 has many useful features, but takes some time to really tailor it to your own sound. You just have to keep searching and you will get there. 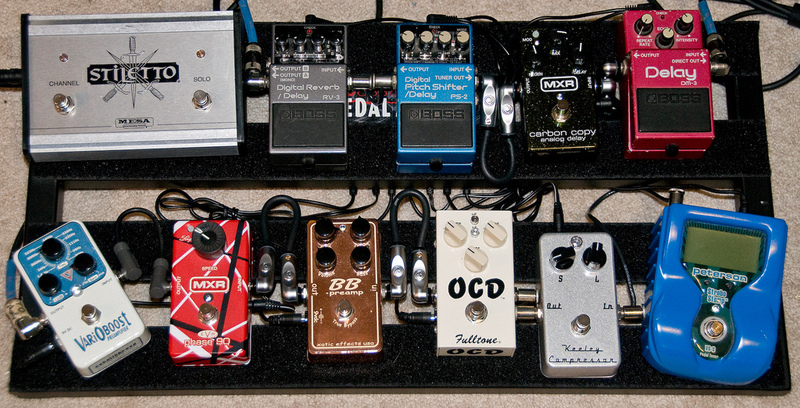 The control section might seem a bit too much to those who are used to other types of wah pedals. But it is not more complicated than any other effects stompbox. Do not let it scare you, because it will seem like a child’s play once you understand what is what. I will break everything down for you so that the control section of AW-3 does not seem like a terrifying beast. It starts with the Decay, which modifies, how fast wah and humanizer effects disappear. Manual sets the frequency range of the wah effect and can select Vowel 2 in the Humanizer mode as well. Sens adjusts how much effect is applied to your sound depending on your picking intensity. It can also select Vowel 1 when in Humanizer mode. Last knob you will see here is Mode, which allows you to choose between five different modes. You can also set the tempo of the Tempo mode with the combination of the footswitch and Decay knob. You just have to follow simple steps. That’s it. As you can see, there is nothing too complicated about this pedal. You simply have to connect your guitar and trying out different settings to see what works best for you. Before we move on to discussing the sound of AW-1 in depth, I want to point out that its sonic versatility should be taken with a grain of salt. Even though everything sounds good on its own, some modes and settings might not be useful for everyone. It depends on what you like in your wah pedal. Now that we have that out of the way, I will go on and say that AW-1 sounds quite decent. There are distinctive differences between the modes, which makes them even more diverse. Up and Down modes concentrate on either higher or lower frequencies, respectively. Sharp accentuates the trebles and makes the wah effect stronger and more prominent. Humanizer alters the guitar signal in order to mimic the human voice. This one is a bit queer, but once you get the hang of it, you will enjoy that weirdness a great deal. The Tempo mode allows you to set the rhythm of your wah and generate intense percussive effect. The great thing about AW-3 is that it does not offer the standard wah you see in every other unit. On the contrary, it forces you to look at things differently and experiment with unusual sounds. Once you understand Boss AW-3 to the fullest, you will be able to unveil its true capabilities. And that is where numerous sonic doors will open up for you. This pedal is definitely different and unique in its characteristics and can be a really cool and useful unit to play with. Those who are after classic Cry Baby sounds might not be into this one, but who knows, even those might find something that works for them. Give it a shot and judge yourself. Good luck!